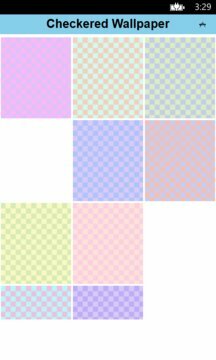 Dress up your background with colorful checkered wallpapers! Checkers are a classic print that never goes out of style! From checkered dress shirts to red and white checkered picnic tablecloths, checkers are a fun and versatile pattern that can be used anywhere! 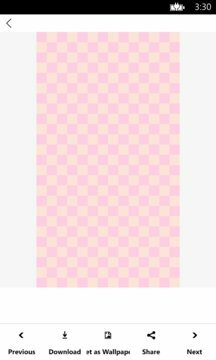 If you're looking for a simple yet visually pleasing pattern for your phone or tablet background, checkered wallpapers are perfect! With this app you'll find checkered wallpapers in a variety of color combinations, allowing you to customize your wallpaper to reflect your unique style! From soft pastels that evoke the feeling of sunny springtime days, to bold black and neon checkers that show your wild side! You'll even find unique checkered wallpapers that fade from one color combo to another, creating an exciting and varied take on this classic, timeless pattern. If you've ever played the classic board games checkers or chess, you are familiar with the standard game board that features a checkered pattern of alternating squares of two different colors. For centuries humans have loved this simple yet interesting pattern of contrast! Picking the special color combo is the fun part where you get to show off your style! Enjoy checkered wallpapers and share with your friends!